Home Companies Hubei Fotma Machinery Co., Ltd.
FOTMA is a provider which not only provides a full range of storage and logistics equipments, but also provides warehousing and logistics technology services. The core values of FOTMA are resource integration, demand fulfillment and growing together. 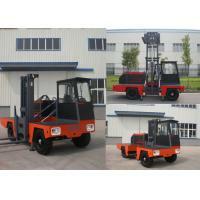 Over the decades, FOTMA has played a key role in warehouse equipment industry of China. Focus on the environment, the earth and our common home has always been FOTMA's social commitment. FOTMA will constantly develop new warehouse equipments to meet market demand through innovation and new technology. Meeting market demands is what motivates FOTMA. To meet various customer needs, FOTMA not only offers a full range of material handling equipment, but also builds an international technology service platform with a team of FOTMA experts which provides professional service and values for customers. Loading and unloading long cargo entering warehouse door.